Its true. 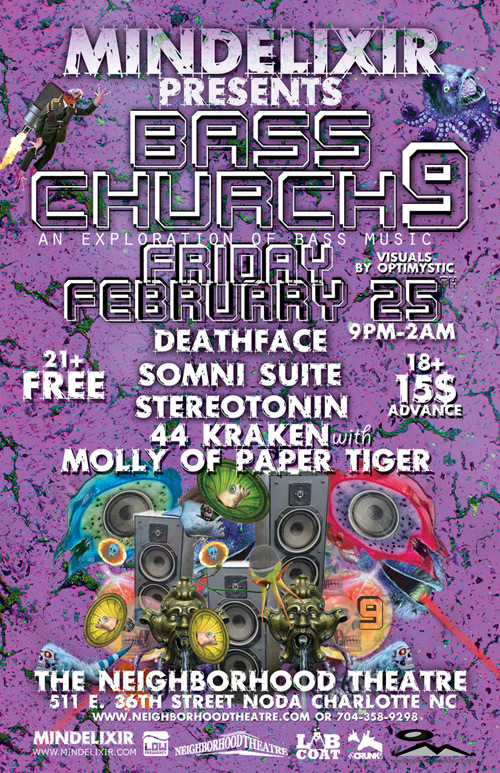 Due to 100% unavoidable circumstances outside of our control, this month’s Mindelixir Presents Bass Church is 21+ only. We are actively looking for an 18+ solution and will make it up to you ASAP. If you bought tickets I’m going to personally make sure every single one of you gets a full refund, 3 passes to 18+ Mindelixir shows, a shirt, a physical music release AND a digital release. Whether it’s recording samples in isolated tunnels, cutting up found sounds on an MPC, programming analog synths, or layering unorthodox guitar and drum sounds, Sonmi Suite creates sounds that are sure to open the imagination of any audience. The enigmatic band has entertained audiences at Trinumeral 2009, and shared other regional electronic festivals with artists such as Bonobo, Pnuma Trio, Glitch Mob, BlueTech, Two Fresh, and Emancipator. By performing indulgently rhythmic collages of sound with virtually no pre-sequence, their virtuosic performance of multiple sound layers creates a much sought-after human edge to the live electronic genre. Stereotonin seeks inspiration for his addictive instrumental tracks drawing from the work of artists spanning every genre; from Sly and The Family Stone to Flying Lotus. Based in Nashville, TN, Stereotonin with musicians of all eras and styles. Years of collaborations with rap artists, realized that the atmosphere of his music was often in conflict with the message of the lyricist. Reluctant to tie his music to any one genre, Stereotonin created beats which would evoke both emotion and vision, through sound without verbal cues. With consistent new tracks and a spot on the December 23rd Bass Church line-up (Charlotte, NC), Stereotonin is one of the South’s most exciting new producers. Molly Kummerle is RubySlippers and is a well-known personality in the Asheville performance arts scene. She has performed at the Asheville Area Arts Council’s Blue, Pink, Green, Red and White balls, was casted in the stage production of the Rocky Horror Show, sang choir for Terpsicorps presents The Scarlet Letter, and played lead in the Asheville Ballet’s production of Porgy & Bess. She has performed Cabaret with members of Stephanie’s id, JUMP Little Children, The Goodies, Bill Carson, The Rebelles and Terpsicorps Theater of Dance. Molly has played shows at the Grey Eagle, Stella Blue, the Orange Peel, IdFest and BeleChere and toured regionally with her trio project. On a ZOOM 8 track digital recorder and a Yamaha synthesizer, Molly began to write, record and produce her own material. One of those songs can now be heard re-mixed by Dave Hamilton on the MOOGED OUT ASHEVILLE compilation CD released through the MOOG Foundation. 44 Kraken was summoned from the same depths surrounding the mysterious island that killed the Dodo Bird. Weilding unusually large fingers, this beast of the depths is ready to party like its 1999. Eat a banana.